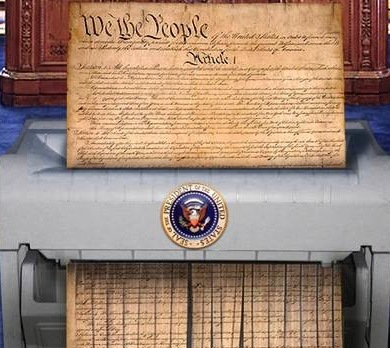 Putting the Constitution at Extreme Risk | No Convention of States! Several bills calling for a dangerous Article V Convention could soon come up for debate in the State Senate. These bills put the Constitution at extreme risk and I need your help to stop them. Some well-meaning Article V supporters think calling a constitutional convention will help create new “limits” on the federal government. And many believe a constitutional convention can be limited to certain types or categories of changes. But that simply is not true. Article V itself does not back up any assertions that a convention can be limited — and noted constitutional scholars agree. Did you know the various special interest groups pushing different Article V Convention measures have formed a coalition? All of these special interest groups claim to be working toward a convention limited to their own issue, yet they are working together behind the scenes. Groups like Convention of States — who claim to want a convention to limit the federal government — are working with groups like Wolf PAC — who want to limit YOU. Lawrence Lessig — a friend to Wolf PAC and former advisor to the Obama campaign — is also on the list of people pushing hard for an Article V Convention. Lawrence Lessig advocates for legislation forcing you to fund the campaigns of candidates you don’t support by making campaign financing a mandatory, taxpayer obligation. Like Wolf PAC, he wants a constitutional convention to pass an amendment that would limit your political speech rights protected by the First Amendment. “The beauty of a convention is that it would provide a forum of possibility for conservative Tea Party types… as well as progressives. Concerned American, it’s critically important you take action to stop this train wreck before it’s too late. Elected governments at all levels are trampling on your rights every day and it’s up to you and me to stop them. But an Article V Convention would only add fuel to the fire. As pointed out above — a convention CANNOT be limited, so proposals from the likes of Lawrence Lessig would be fair game. And once everything is said and done, every existing amendment could be utterly dismantled. Even if “conservatives” managed to propose an idea or two, it would be open season on the Constitution — nothing would be off-limits. And what “conservative” victory could possibly justify new restrictions on your First or Second Amendment rights? You’d think with views like Lessig’s, conservatives wouldn’t even be caught in the same room with him. But he’s spoken at multiple conferences alongside conservative “leaders” in the movement — all promoting an Article V Convention. These “conservatives” are working with liberals like Lessig, who want to use an Article V Convention to restrict your rights, yet they claim there is no reason for you to oppose a convention! Literally hundreds of progressive organizations, such as Sierra Club, Code Pink, Alliance for Progressive Values, MoveOn, and “Occupy,” have been pushing for a convention since 2009. Do you trust THEM to fall in line and rein in the government? Some argue if a convention results in proposals to gut our Constitution, it would still take 3/4 of the state legislatures to ratify. We can’t even get 1/4 of the states to stand against Common Core. Politicians involved in the convention process will be working double time behind the scenes to ensure their pet amendments get ratified. And there’s no predetermined time limit for the states to ratify amendments unless the U.S. Congress proposes one, so politicians could have an untold number of legislative sessions to work toward their goal. Don’t fall for it. Those holding power will stop at nothing to get what they want. These bills simply MUST be stopped; please take action right away! P.S. Several bills calling for a dangerous Article V Convention could come up for debate in the Arizona Senate soon. These bills put the Constitution at extreme risk. Be sure to forward this email to your contacts in Arizona. Please note: Arizona Council for Freedom and Enterprise (AzCFE), paid for this communication and is solely responsible for its content. AzCFE is a project of the National Council for Freedom and Enterprise (NCFE), an IRS 501(c)4 non-profit organization. Donations are not tax deductible as charitable contributions or as business deductions.